Few medical devices hold as much potential for explosive growth as spinal-cord stimulators , especially in the United States, where they are being pushed as the answer to the country’s opioid epidemic. The global market for spinal-cord stimulators has grown from $300 million in 2001 to nearly $2 billion in 2017, according to an estimate by Nevro, a Redwood City, California, company that manufactures the devices. The financial services firm Canaccord Genuity Inc. has estimated that the market could approach $20 billion, saying the current market penetration represents only about 7 percent of potential customers. The U.S. is by far the biggest market for the stimulators. Medicare, major insurance carriers and a majority of states’ worker compensation programs cover implantation of the devices. The top four manufacturers are Abbott, which got into the market in January 2017 with the $23.6 billion purchase of St. Jude Medical Inc.; Boston Scientific Corp.; Medtronic, and Nevro. Medtronic is among the world’s largest manufacturers of medical devices overall. Its pain therapy products had net sales of just over $1 billion in fiscal year 2017. Boston Scientific said net sales of its neuromodulation products, which include spinal-cord stimulators, was $635 million, or 7 percent of net sales last year. Abbott combined figures for its neuromodulation and cardiovascular products, showing net sales of $8.9 billion in 2017. Before being acquired by Abbott, St. Jude reported that its neuromodulation products, including spinal-cord stimulators, had net sales of $475 million in 2015. Only Nevro exclusively produces spinal-cord stimulators, making its market estimates the clearest indicator of the device’s growing gains in the United States. Nevro’s stimulator has been available in some European markets since 2010 and in Australia since 2011. The company’s revenues soared after it received U.S. Food and Drug Administration approval and launched U.S. sales in May 2015: Nevro reported total revenue of nearly $33 million in 2014. By 2017, revenue had skyrocketed to about $327 million. Like opioids, spinal-cord stimulators mask pain, but that’s where the similarities end. The stimulators use electrical currents to block pain signals before they reach the brain. Pain medications, such as OxyContin and Percocet, instead change brain chemistry and are highly addictive. With physicians facing increasing criticism for writing narcotic prescriptions, the device manufacturers hope the opioid crisis can drive future sales and have reached out to powerful allies in Congress to try to ensure that. 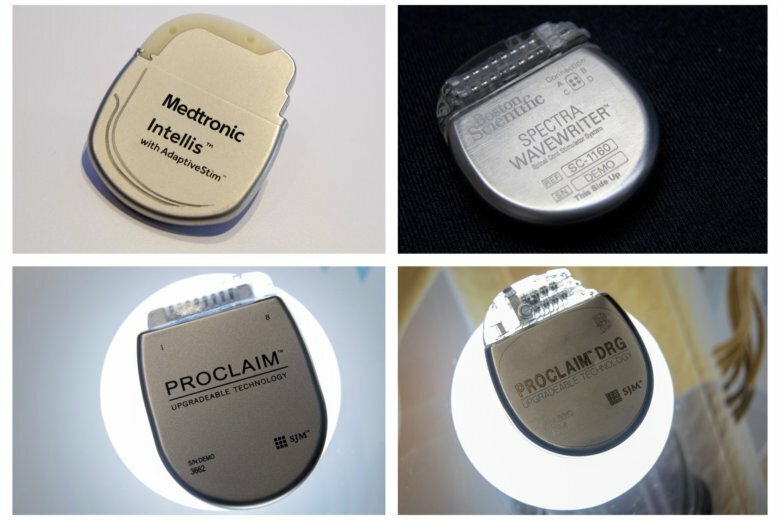 Lobbying records show that Medtronic, Boston Scientific, Abbott and Nevro have spent more than $22 million combined since 2017 trying to influence legislation that would benefit their overall business, which extends beyond just stimulators. Abbott has spent about $9.6 million, Medtronic $9.4 million, and Boston Scientific $3 million, according to an analysis by NBC, AP’s partner in the reporting collaboration. Nevro spent at least $160,000 on lobbying firms with ties to former high-ranking government officials, the data shows. Device manufacturers have worked through the industry association AdvaMed to lobby Congress for legislation that includes spinal-cord stimulators as an answer to the opioid crisis. AdvaMed declared in February that “safer alternatives to opioids are already here,” specifically mentioning stimulators as an effective treatment for pain. The association’s president, Scott Whitaker, wrote Senate lawmakers that Congress should require government agencies to “provide increased educational opportunities” to doctors about medical devices that treat pain. His letter also said the government should do a better job paying for pain devices through Medicare, the federal program that provides health care for 60 million seniors and Americans with disabilities.